The weather is getting nicer, and it’s time to start spending evenings on your patio, by the pool, or just relaxing in your outdoor space. Creating an oasis where you want to spend your time is a must as it helps calm you after a busy day. The time is now to host guests and utilize your outdoor living area. 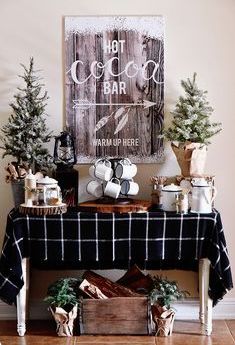 A few simple additions, adjustments, or quick changes will have your space ready for relaxing and entertaining with style. KF knows what an asset having a space outdoors that is truly livable and inviting can do for your lifestyle. Kathy has been hard at work re-inventing her own outdoors for upcoming spring and summer events and parties. 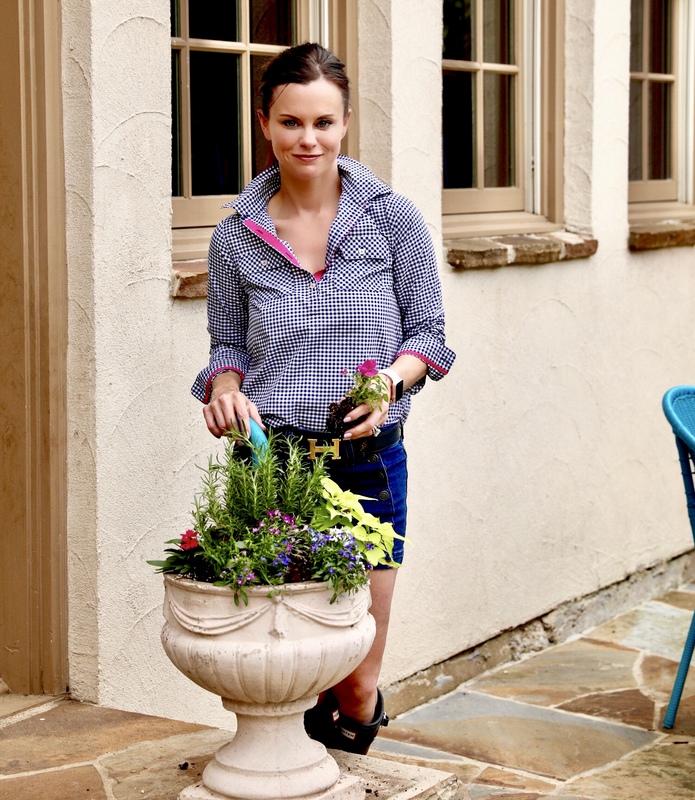 We asked her to give us some tips on how to create the perfect indoor environment outside. Starting is the toughest part. 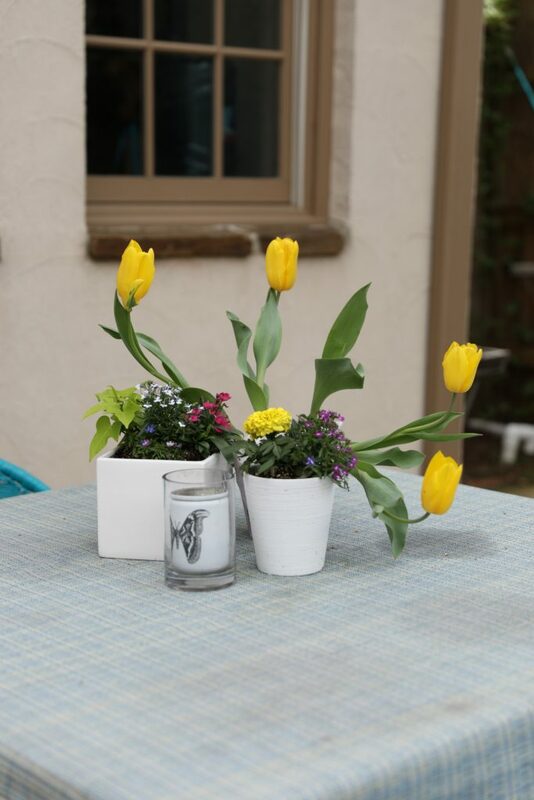 The best part about revamping your outdoor space is you ease the work and time constraints by simply adding and enhancing, much like reworking a room inside your home. By doing this, you give the whole space a “face lift”. 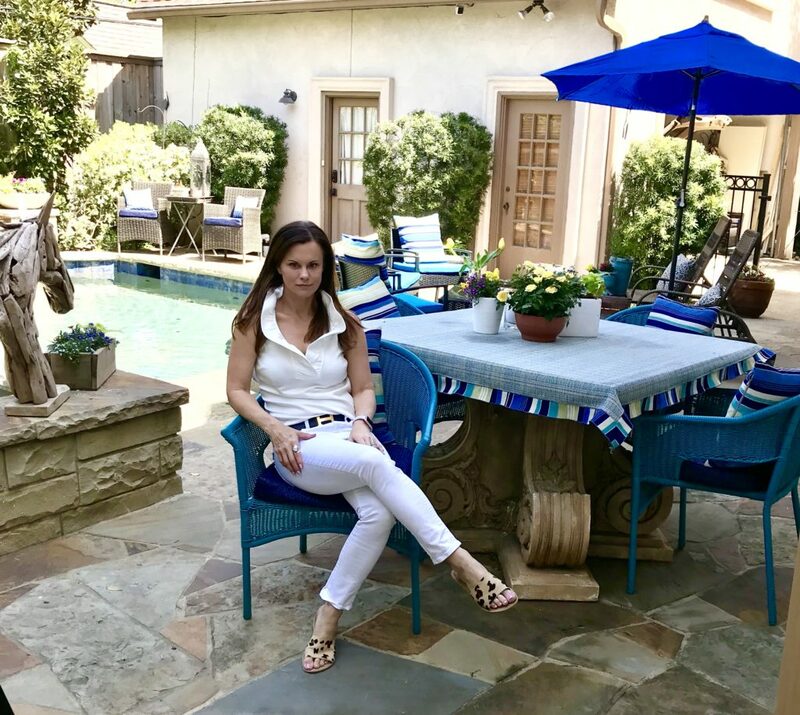 KF started with two lounge chairs and an umbrella and transformed her entire backyard space into a livable and inviting place to sit and entertain friends and family or have a cup of coffee in the morning. 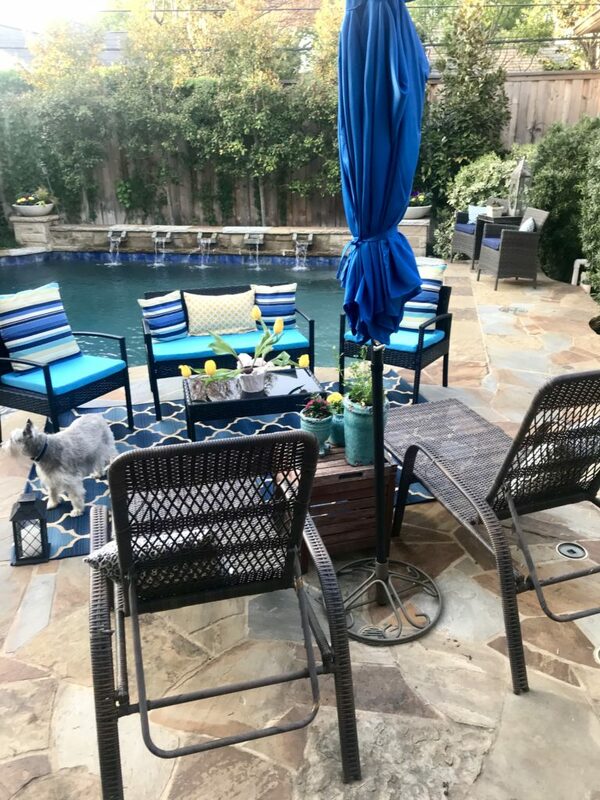 With just a few additions she added more sitting space, grounded it with an outdoor rug, and gave her entire backyard a completed and welcoming look. If you’re adding to an existing space make sure the additions you choose coordinate with your existing pieces. Whether you tie them in with similar finishes, colors, textures or hardware, it is important to have flow in any sort of design in order to create continuity. Just like inside your home, a rug makes a transformative difference. Whether you want to get one that features the colors you already have or mix it up with something new, an outdoor rug is the quickest way to complete the space. It makes the area feel finished and warm. An outdoor rug grounds the area in which it’s place, and according to Kathy, “If you have a lot of “leggy” pieces, there is something transformative about placing a rug with them that gives them a more grounded look. An umbrella is a must have in a space that is in direct sunlight. Although they are one of the most functional pieces in your outdoor arsenal, they also add a certain ambience and high style to your decor. Having multiple areas for entertaining or different activities really makes your outdoor oasis what it is meant to be, a living room for the outdoors. A place to lounge in the sun, have a meal, or sit and read a book really are advisable to create the perfect space. Choose pieces that are special or make a statement. 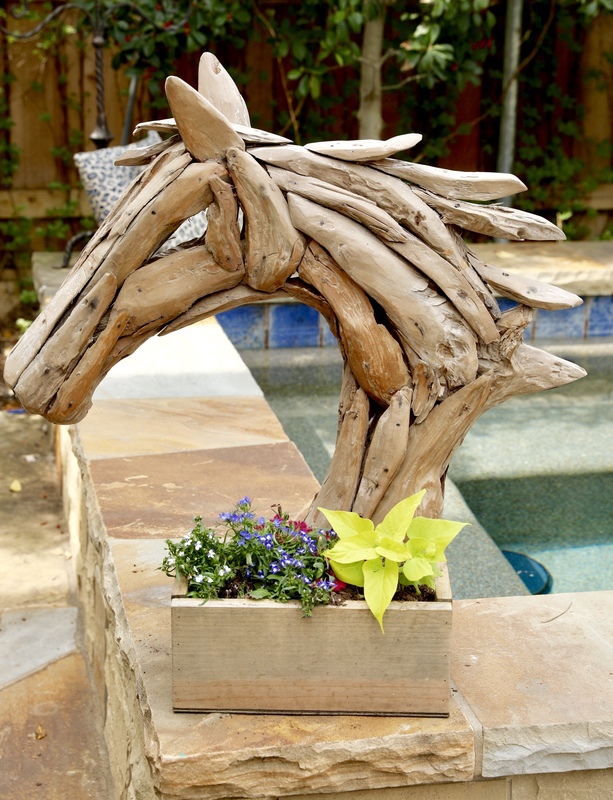 This horse bead sculpture was a gift from Kathy’s dear friend, Britt Harless and is a favorite focal point for her in her outdoor garden, a reminder of people she loves and one of her great passions, horses. Choose pieces that remind you of things and people that make you happy. It will enhance your experience that much more. Surrounding yourself with things you love and matter to you is one of the key elements of great design. Accessorize with flowers, greenery, planters, and outdoor accessories to complete and make your outdoor rug more inviting. Looking for inspo to redo your annuals and planters? Check out last week’s blog!